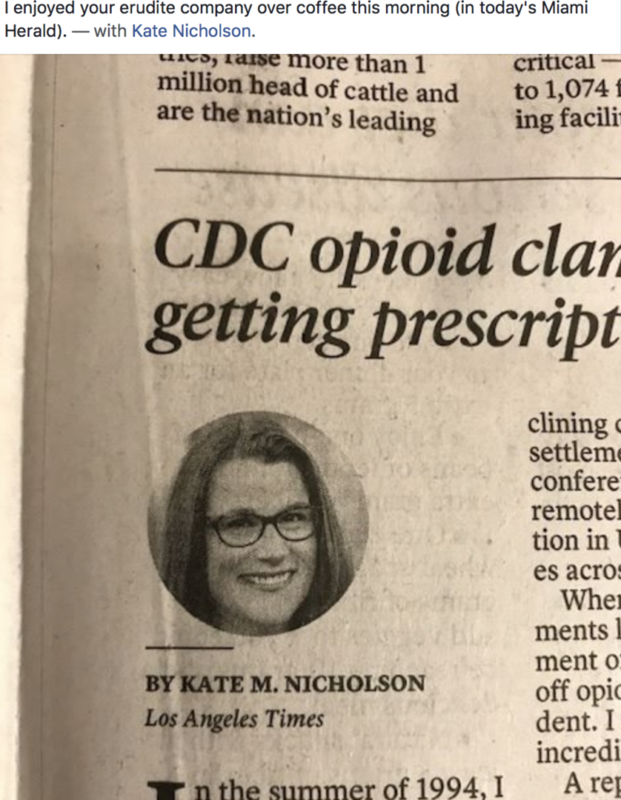 This week, I wrote a opinion piece in the Los Angeles Times about cautionary and, at times, harrowing findings of the watchdog group, Human Rights Watch, about what is happening to pain patients from the clampdown on opioid prescribing. Patients who have used opioids appropriately, often for years, are being forcibly tapered off of them and abandoned in care by their treating physicians. Many chronic pain patients are unable to find alternative healthcare options, even those who do not use prescription opioids as part of their pain management. The piece was syndicated and picked up in other publications like the Miami Herald (image above), the Kansas City Star, Newsday, and many others. In it, I urge the Centers for Disease Control and Prevention (CDC) to modify its guidelines for prescribing opioids in chronic pain to come out formally against forced or precipitous tapering of stable patients off of opioid pain medication and against patient abandonment. There is precedent for doing so: British Columbia which has the highest drug overdose rate in Canada, recently modified the regulatory guidance on opioid prescribing in order to protect pain patients from abandonment. This piece adds to the piece I co-authored in December with Dr. Chad Kollas and Professor Diane Hoffmann, for STATnews, that outlines the way in which the CDC’s guideline has been misapplied by major pharmacy companies, insurance companies, some state Medicaid programs, statenlegislatures and other regulatory bodies. This article begins with a story told at the American Medical Association recent meeting by its President, a cancer doctor, about her patient whose pharmacist denied the medication she prescribed to treat severe pain from prostate cancer that had spread to his bones. Unable to to endure the pain, her patient attempted to kill himself. The consequences of denying legitimately prescribed pain medication to a patient for whom the medication is necessary and appropriate can be dire – resulting in medical decline, disability and death. Systemic reductions in prescribing are a laudable goal if approached judiciously and with appropriate nuance and caution. But at a moment when prescribing has reached a 15 year low, according to the Food and Drug Administration, and when overdose deaths are primarily driven by illegally produced opioids and stimulants like cocaine, according to CDC data, ripping necessary and appropriate medications from people who rely on them will only do further harm.